Drive in the right hand lane when you arrive at ferry harbor. Stay on the right side when you stop at the end of the queue, so that vehicles with the right of way can safely skip the queue. Avoid idling and turn off the headlights, so that they do not disturb the ferry driver in darkness. 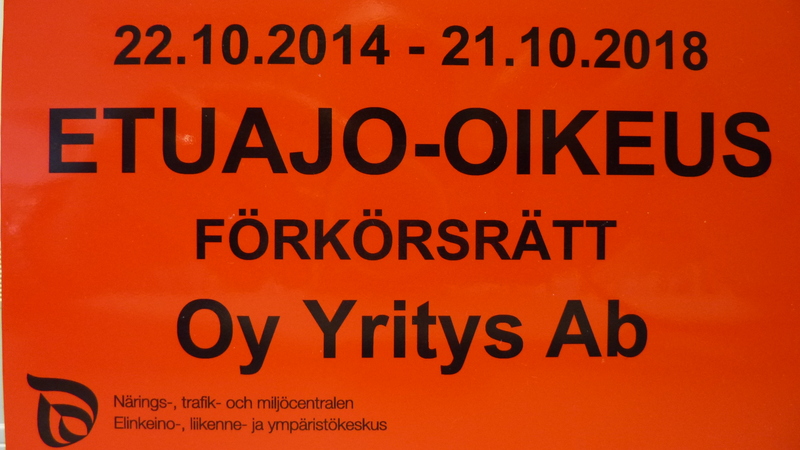 Motorcyclists are not allowed to bypass the queue without the issuance of Southwest Finland's ELY-centre right of way. The driver shall, on request, be informed of about the vehicle axle, bogie and total weight, and content load. The ferry staff should be informed of the transport of dangerous substances before driving on board the ferry. Close the main valves of any gas bottles carried within passenger vehicles before driving on board the ferry. If you drive a truck, always check beforehand the weight restrictions at the ferry locations from the ferry location pages or call the ferry. You may drive on or off board the ferry only when the assigned traffic lights are on and the booms are lifted or driving permission has been given by ferry staff. Vehicles first drive into the right side of the ferry, then into the left lane or as the staff or traffic lights instruct. Heavy vehicles drive into the center of the ferry. Make sure that the vehicle is able to exit, at least from one side. Lock the parking brake, turn off the headlights and stop the engine. Then exit the vehicle only when the ferry is moving. Getting off the ferry is typically done in the same order in which you drove on board. Leaving is possible only when the red lights are extinguished and the boom is raised or the staff gives its permission. The main valves of gas containers, for example, in passenger vehicles, should be closed throughout the entire trip duration. If an emergency situation so requires, put on the life jacket as shown in the manual. Life jackets are in close proximity to the car deck. 3) All, to whom the ELY Centre has granted the right-of-way and whose right-of-way is appropriately valid and whose travel in question falls within the sphere of right-of-way authorisation. 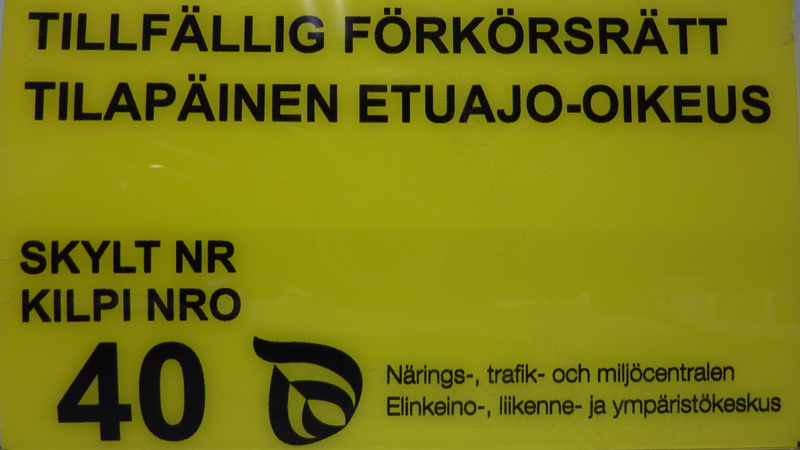 See Criteria for granting right-of-way (in Finnish only). The right-of-way as granted by the ELY Centre does not authorise anyone to pass others who have right-of-way authorisation. 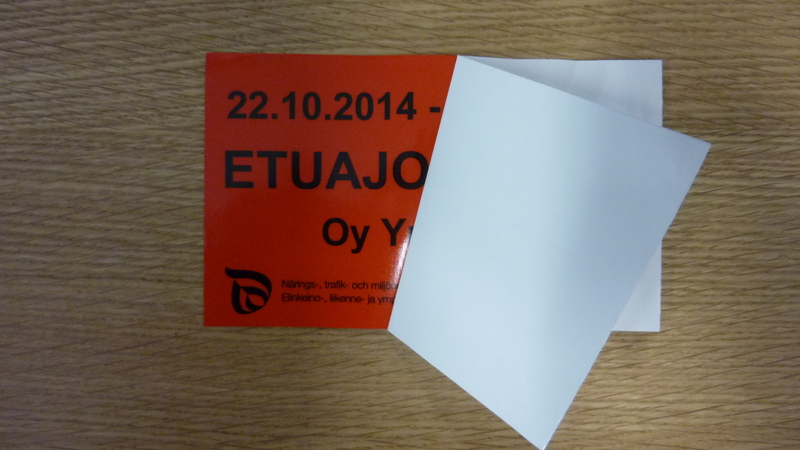 Placards are provided to indicate the vehicle’s right-of-way authorisation. Other road users, in principle, will be loaded aboard the ferry in order of arrival. The ferry captain, however, has the right to derogate from the order of arrival should the ferry’s deck space or its carrying capacity or weather conditions not allow for transporting the next vehicle in the queue. Right-of-way authorisation does not apply to exiting the ferry. There are traffic lights at the Pargas–Nagu and Hailuoto ferry harbours. When the ferry starts loading, the vehicles in the right-of-way lane will first be allowed aboard when the light is green. The light will turn red when the lane has emptied out. After this, the other traffic from the lane will load aboard the ferry. The red light indicates the end of loading vehicles from the right-of-way lane. There can be, only in exceptional cases, a continuation of loading vehicles from the right-of-way lane together with the normal traffic lane or afterwards, as necessary. When at the ferry harbours, vehicle operators should use caution, follow the speed limits and traffic lights to avoid risks. When loading aboard, the road users must also follow the instructions as given by the ferry crew. The police have the authority to ticket road users for abusing the right-of-way lane. As the licensing authority, the ELY Centre can revoke right-of-way authorisation or provide comments on the violation of permit conditions. Upon surveillance of right-of-way authorisation, the ELY Centre and the police can remove a vehicle from the queue that is using the right‑of‑way lane incorrectly. More detailed information can be found at the Ely Centre's website.